Kia Niro Price: A Sweet Spot in the Crossover Hybrid Market! 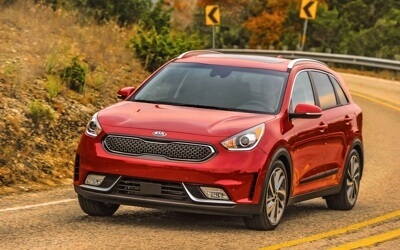 The Kia Niro price helps Kia redefine the crossover hybrid SUV market, proving that high-tech design doesn’t have to come with a high price tag! The 2017 Kia Niro price starts at $22,890 to the delight of tech-savvy drivers everywhere. The launch of this innovative crossover offers an all-new solution for drivers who want a versatile SUV that blows the doors off traditional fuel economy. FE (MSRP $22,890): The base trim starts off the lineup with an impressive EPA-estimated gas mileage of 52 mpg highway/49 mpg city. It includes a wealth of features like keyless entry, seven-inch display with rearview camera and touchscreen controls, six-speaker sound system with controls mounted to the steering wheel, UVO3 with Apple CarPlay™ and Android Auto™, and much more. LX (MSRP $23,200): The next trim level adds push button start, roof-mounted rails for carrying luggage and sports equipment, LED rear combination lights, and the option for fog lights. Buyers can also add a suite of advanced safety features including Forward Collision Warning and Autonomous Emergency Braking. EX (MSRP $25,700): The EX trim includes upscale amenities like LED daytime running lights, heated combination cloth and leather seating, leather-wrapped steering wheel, heated mirrors with power-fold, and front fog lamps. It also adds driver assistance technologies like Blind Spot Detection with Rear Cross Traffic Alert and Lane Change Assist. Touring Launch Edition (MSRP $28,000): The special limited Launch Edition is available in Snow White Pearl and Aurora Black Pearl with exclusive Hyper Gray 18-inch alloy wheels and Michelin tires. It also sports a distinctive grille, 10-way memory-based power driver’s seat, eight-inch touchscreen with navigation, and high-end Harman Kardon® eight-speaker premium audio system. Touring (MSRP $29,650): The top-level Niro trim is truly loaded with everything: heated and cooled seats, heated steering wheel, and power tilt/slide sunroof, 10-way power driver’s seat, programmable memory, and a top-of-the-line Harman Kardon eight-speaker audio system. Option Packages: Buyers can choose safety upgrades like Smart Cruise Control, Forward Collision Warning, Autonomous Emergency Braking, and Lane Departure Warning System. Other options include a power/tilt sunroof, high-intensity discharge headlights, wireless phone charger, and 110V inverter. The 2017 Kia Niro price is an absolute steal given its feature-rich trims and phenomenal fuel economy. Learn more at Jeffrey Kia, including when you can expect this hybrid crossover to hit the showrooms in 2017. Contact us today!